Many kids dream of serving their country in the military. And even though not everyone grows up to do so, they can still have fun with it while they are still kids! 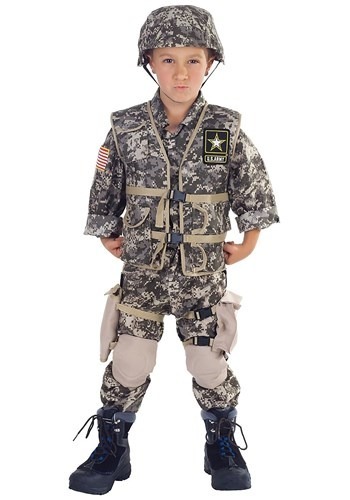 This deluxe kids Army Ranger costume comes with all of the essential items your little soldier needs for a realistic and complete costume this Halloween. This officially licensed costume starts with the camo pants that have an elastic waist for a comfortable fit. The shirt has a wing collar and fastens with Velcro at the center front. It also has embroidered flag and Army patches on it. A padded vest goes over the shirt and has multiple cargo pockets with Velcro flaps to hold all of their essential accessories for the night. The vest fastens with plastic buckles at center front. Slide the tan knee pads over the pants and fasten them with webbing straps and Velcro. A thigh holster and pouch have adjustable-length webbing straps that fasten with plastic parachute buckles for added detail. Top it all off with the included plastic helmet with chin strap and fabric helmet cover. When I had an issue with my costume, Halloween Costumes came to the rescue. They immediately contacted me to help fix the problem. We are very impressed with the care they show their customers.